Vegetables have been part of human food since prehistoric times and are considered nutritionally necessary and good for health. Vegetables are rich natural resource of biological antioxidants and possess capabilities of maintaining glucose homeostasis. When taken before starch-rich diet, juice also of vegetables such as ridge gourd, bottle gourd, ash gourd, chayote and juice of leaves of vegetables such as radish, Indian Dill, ajwain, tropical green amaranth, and bladder dock are reported to arrest significantly the rise in postprandial blood glucose level. Juice of vegetables such as ash gourd, squash gourd, and tropical green amaranth leaves are observed to tone-down sweet-beverages such as sucrose, fructose, and glucose-induced postprandial glycemic excursion. On the other hand, juice of egg-plant and juice of leaves of Ceylon spinach, Joyweed, and palak are reported to augment starch-induced postprandial glycemic excursion; and juice of leaves of Ceylon spinach, Joyweed, and radish supplement to the glucose-induced postprandial glycemia. Vegetables possess multifaceted antihyperglycemic activities such as inhibition of pancreatic α-amylase and intestinal α-glucosidase, inhibition of protein-tyrosine phosphatase 1β in liver and skeletal muscles, and insulin mimetic and secretagogue activities. Furthermore, they are also reported to influence polyol pathway in favor of reducing development of oxidative stress, and consequently the development of diabetic complications. In the wake of emergence of modern maladaptive diet-induced hyperglycemic epidemic therefore, vegetables may offer cost-effective dietary regimen to control diet-induced glycemic over load and future development of diabetes mellitus. However, for vegetables have been reported to do both, mitigate as well as supplement to the diet-induced postprandial glycemic load, care is required in selection of vegetables when considered as medicament. Objective: To investigate possible effects of aqueous taxus baccata extract on adenosine deaminase (ADA) activity in cancerous and noncancerous human tissues and to clarify mechanism(s) of its anticancer potential. Materials and Methods: Cancerous and noncancerous human gastric and colon tissues were used in the study. The extracts were prepared in distilled water. Before and after treatment with the extracts, ADA activities in the tissue homogenates were measured. Results: ADA activity was found to be higher in gastric tissue compared with colon tissue, but no differences were found between ADA activities of cancerous and noncancerous tissues for both as well. In the plant extract studies, it was found that taxus extract significantly inhibited ADA activity both in cancerous and noncancerous gastric and colon tissues. Conclusion: Our results suggest that aqueous extract from taxus baccata inhibits ADA activities in both gastric and colon tissues significantly. It is suggested that in addition to other proposed mechanisms, accumulated adenosine due to the inhibition of ADA enzyme might also play part in the anticancer properties of taxus species. Background: Liver diseases have become a major problem of the worldwide. More than 50% of all cases of liver failure can be attributed to drugs. Among these, acetaminophen is the most common cause. 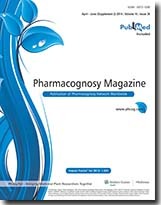 Objective: The aim of this study was to investigate the the hepatoprotective effects of blueberry and chitosan on tissue arginase activity, ornithine and nitric oxide levels during the acetaminophen-induced hepatotoxicity. Materials and Methods: Acetaminophen (250 mg/kg body weight per day), blueberry (60 mg/kg body weight per day) and, chitosan (200 mg/kg body weight per day) were administered to the rats by oral gavage during the experimental period. Results: Blueberry and chitosan significantly decreased liver arginase activity and ornithine levelsand and increased nitric oxide levels. Glutathione levels were remarkably increased by chitosan and blueberry treatments. Conclusion: The results of the present study indicate that blueberry and chitosan effectively protected against the acetaminophen-induced hepatotoxicity. The hepatoprotective effect afforded by blueberry and chitosan can be attributed to its antioxidant and anti-inflammatory activities. Background: This study assessed the extraction efficiency of ursolic (UA) and oleanolic acids (OA), as well as the total phenols in aqueous and hydroethanolic extracts of dry apple peels at room temperature. Materials and Methods: After running preliminary assays on decoctions and tinctures (ethanol: water 7:3 v/v), the extracts from dried apple (cv. Fuji) peels were obtained by static maceration over varied intervals (2 to 180 days). The UA and OA content in the extracts was quantified by High Performance Liquid Chromatography with Diode Array Detection (HPLC-DAD) with a reversed phase column and isocratic elution (CH 3 CN/H 2 O/H 3 PO 4 ) against calibration curves (R 2 > 0.9995). The total phenol content in the extracts was evaluated spectrophotometrically at 760 nm using the Folin-Ciocalteau method referencing gallic acid. Results: UA and OA in the hydroethanolic extracts ranged from 3.63-6.12 mg/g and 2.12-3.30 mg/g, corresponding to 1.72-3.07 and 1.00-1.66 mg/g in the raw material, respectively. Higher values of triterpene acid content corresponded to maceration periods of 10 or 30 days. The residual phenol and polyphenol content ranged from 6.97 to 11.6 mg/g. The UA and OA yields, as well as the total phenol content, versus the maceration time were plotted in Control Charts within confidence intervals (95%) and were unaffected during the assayed period. Conclusion: Apple peel tinctures from 10% solids obtained at room temperature exhibited the highest content of triterpene acids when employing a maceration period of 10 to 30 days. Extracts prepared using this procedure contained an average of 7.33 mg/g of total triterpene acids and 10.6 mg/g phenolic compounds. These results establish supporting data for apple peel tinctures and their derived phytopharmaceuticals that are standardized on the ursolic-oleanolic acid content. Background: Our earlier study on the antiproliferative (APF) activity of leaf extracts of ten Apocynaceae species showed that leaves of Vallaris glabra possessed strong and broad-spectrum properties. Materials and Methods: In this study, sequential extracts of leaves, flowers and stems, and fractions and isolated compounds from dichloromethane (DCM) leaf extract of V. glabra were assessed for APF activity using the sulphorhodamine B (SRB) assay. Apoptotic effect of MDA-MB-231 cancer cells treated with DCM leaf extract of V. glabra was studied using Hoechst 33342 dye and caspase colorimetry. Results: Both DCM extracts of leaves and flowers possessed broad-spectrum APF activity against HT-29, MCF-7, MDA-MB-231 and SKOV-3 cancer cells. From DCM leaf extract, stearic acid (SA) and ursolic acid (UA) were isolated by column chromatography, and identified by NMR and MS analyses. APF activity of SA from DCM leaf extract displayed weak inhibitory activity and scientific literature showed UA has anticancer properties against those cancer cells used in this study. MDA-MB-231 cancer cells treated with DCM leaf extract and stained with Hoechst 33342 dye provided evidence that the extract had an apoptotic effect on the cells. Caspase colorimetry showed that the apoptotic effect involved activation of caspase-8, -9 and -3, but not caspase-6. Conclusion: The potential of V. glabra as a candidate species for anticancer drugs warrants further investigation. Background: Oxidation of low density lipoproteins and their further uptake by macrophages is known to result in the formation of foam cells, which are critical in the initiation of atherosclerosis through activation of inflammatory signalling cascades. Thus, powerful dietary antioxidants are receiving attention for the reversal of such pathological states. Materials and Methods: Extracts of Scoparia dulcis have been used as tea and health drinks with various health promoting effects. In the present study, we examined the reactive oxygen scavenging potential as well as anti-inflammatory and anti-atherogenic efficacies, using leaf extracts obtained after successive extraction with various solvents. Results: A methanol extract showed potent antioxidant activity with an IC 50 value of 570 μg/ml, caused hydrogen peroxide scavenging (28.9 µg/ml) and anti-inflammatory effects by improving human erythrocyte membrane stabilisation (about 86%). The methanol extract also efficiently inhibited lipid peroxidation and oxidation of low density lipoproteins, thus preventing foam cell formation in cultured RAW 264.7 cells. Furthermore, phytochemical screening of the extracts showed high accumulation of flavonoids. Conclusions: The foliar methanol extract of Scoparia dulcis has a strong anti-atherogenic potential and this property could be attributed maybe due to presence of flavonoids since HPLC analysis showed high concentrations of myricetin and rutin in the methanol extract. Background: Alzheimer's disease is a neurodegenerative disease related to memory impairments and neuronal cell death. Bozhougyiqi-Tang (BZYQT), a traditional herbal medicine, has been therapeutically used for the treatment of pulmonary tuberculosis. Objective: The aim of this study is to evaluated the neuroprotective effect of the fermented BZYQT and compared with unfermented BZYQT in HT22 cells by MTT assay and tested the beneficial effect on memory impairments induced by scopolamine (1 mg/kg, i.p.) using the passive avoidance and Morris water maze tests. 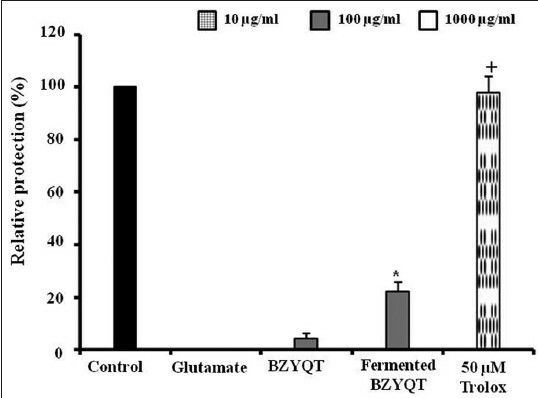 Results: Compared with unfermented BZYQT, the neuroprotective effect of fermented BZYQT on glutamate induced neurotoxicity in HT22 cells increased at a concentration of 100 μg/mL. Fermented BZYQT increased the step-through latency of the passive avoidance response. Furthermore, in Morris water maze test for evaluation of spatial learning and memory, escape latency time was significantly reduced by fermented BZYQT. Conclusion: These results suggest that the fermentation process of BZYQT led to improve neuroprotective and cognitive enhancing effect. Background: Jaeumganghwa-tang (JEGH) is a traditional Korean herbal medicine for the treatment of chronic bronchitis, nephritis and diabetes mellitus. Objective: A high performance liquid chromatography-diode array detector (HPLC-DAD) method was developed for simultaneous determination of 11 major compounds such as 5- hydroxymethylfurfural, mangiferin, paeoniflorin, nodakenin, naringin, hesperidin, decursinol, berberine, glycyrrhizin, atractylenolide III and decursin, in JEGH. Materials and Methods: The separation was conducted on Shishedo C 18 column with gradient elution of 0.1% trifluoroacetic acid-acetonitrile. Detection of wavelength was set at 205, 250, 280 and 330 nm. Results: The developed analysis showed a good linearity (R2 >0.9997). The range of limit of detection and limit of quantification were observed from 0.04 to 0.43 and from 0.11 to 1.30, respectively. The intra- and inter-day test relative standard deviations (RSD) were less than 3% and the accuracy was 95.98-108.44%. The recoveries were between 92.75% and 109.19% and RSD range of recoveries was measured from 0.52% to 2.78%. Conclusion: This HPLC-DAD method can be successfully applied for simultaneous determination of 11 major compounds in JEGH samples. Background: Canonical Wnt signaling plays a key role in tumor cell proliferation, which correlates with the accumulation of β-catenin in cell due to inactivation of glycogen synthetase kinase-3 β. However, uncontrolled expression of β-catenin leads to fibromatosis, sarcoma and mesenchymal tumor formation. Recently, a number of polyphenolic compounds of naturally occurring flavonoid family have been screened for the inhibition of Wnt signaling. Objective: Elucidation of the binding mode of inhibitors to β-catenin, reporting more potent inhibitors for the disease-causing protein and designing a pharmacophore model based on naturally occurring compounds, flavonoids. Materials and Methods: In this study, a comparative molecular docking analysis was performed to elucidate the binding mode of experimentally reported and unknown inhibitors. Based on the knowledge of geometry, binding affinity and drug score, we described a subset of novel inhibitors. 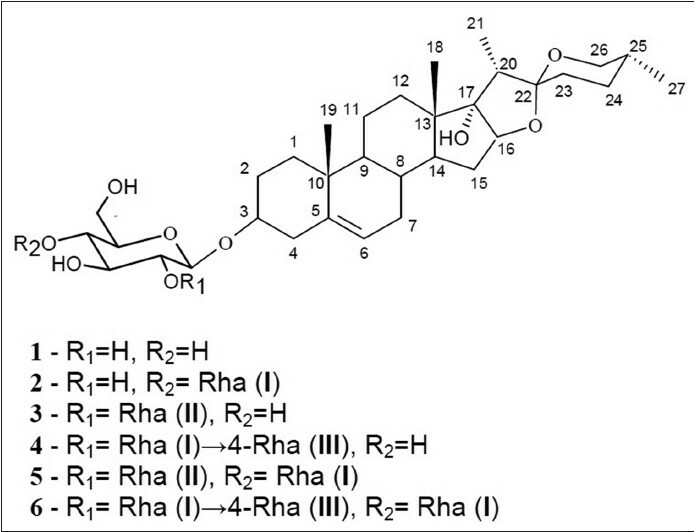 Results: The binding energy of known inhibitors (isorhamnetin, fisetin, genistein and silibinin) was observed in a range of −5.68 to −4.98 kcal/mol, while novel inhibitors (catechin, luteolin, coumestrol and β-naphthoflavone) exhibited −6.50 to −5.22 kcal/mol. We observed good placement and strong interactions of selected compounds inside the binding pocket of β-catenin. Moreover, flavonoid family members and T cell factors 4 (TCF4) compete for β-catenin binding by sharing common binding residues. Conclusion: This study will largely help in understanding the molecular basis of β-catenin/TCF4 inhibition through flavonoids by exploring their structural details. 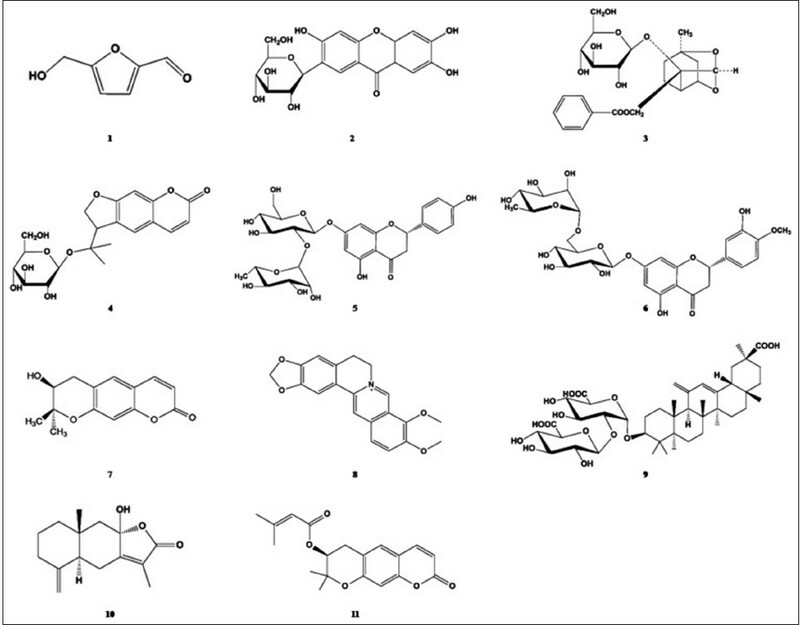 Finally, the novel inhibitors proposed in this study need further attention to uncover cancer treatment and with the generated pharmacophore model, more and potent β-catenin inhibitors can be easily screened. Background: Clove (Syzygium aromaticum) is a well-known culinary spice with strong aroma; contains a high amount of oil known as clove oil. The major phyto-constituent of the clove oil is eugenol. Clove and its oil possess various medicinal uses in indigenous medicine as an antiseptic, anti-oxidant, analgesic and neuroprotective properties. Thus, it draws much attention among researchers from pharmaceutical, food and cosmetic industries. Objective: The aim of the present study was to determine the anti-cholinesterase activity of the methanol extract of clove, its oil and eugenol. 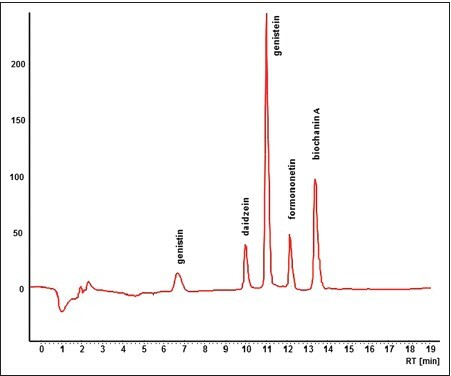 Materials and Methods: In vitro anti-cholinesterase activity of S. aromaticum was performed by a thin layer chromatography bio autography, 96 well micro titer plate and kinetic methods. Reverse phase high performance liquid chromatography (RP-HPLC) analysis was carried out to identify the biomarker compound eugenol in clove oil. Results: Acetylcholinesterase (AChE) and butyrylcholinesterase (BChE) inhibition study revealed that eugenol possess better inhibition of the enzymes than extract and oil. Clove extract, its oil and eugenol showed better inhibition of AChE than BChE. 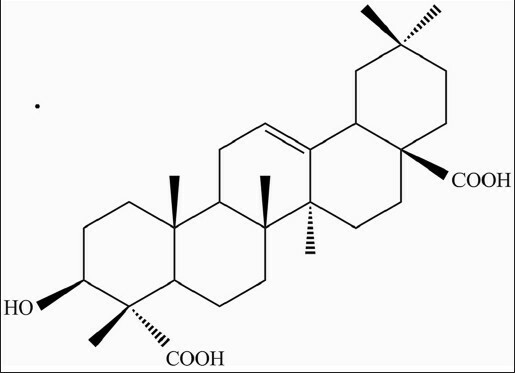 Polyphenolic compound eugenol was detected through RP-HPLC analysis. The content of eugenol in essential oil was found to be 0.5 μg/ml. Kinetic analysis of the cholinesterase inhibition study of the extract; clove oil and eugenol have shown that they possess mixed type of inhibition for AChE and non-competitive type of inhibition for BChE. Conclusion: These results might be useful in explaining the effect of clove as anti-cholinesterase agent for the management of cognitive ailments like Alzheimer's disease. Background: Acacia farnesiana is a medicinal plant that grows throughout tropical parts of Indian subcontinent, particularly in sandy soils of river beds in Northern India. The objective of the present study was to evaluate the anti-hyperglycemic activity of the extracts using glucose tolerance test. Isolation of an active fraction (AF) from the active extract (water extract) using alcohol precipitation and to get insight to the mechanism of action of the AF of A. farnesiana. 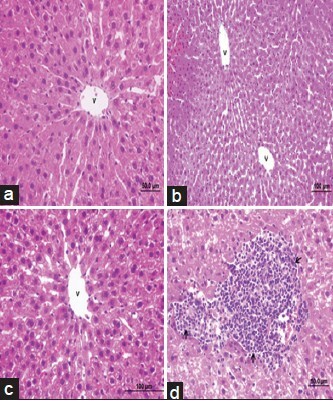 Materials and Methods: Glucose uptake by isolated rat diaphragm of the AF was performed. Further the effect of release of Insulin from isolated and cultured pancreatic β-cell was determined. Besides, effect of oral administration of the AF was compared with that of intraperitonial administration. The effect of AF on serum glucose levels in orally glucose loaded rats was compared with that of intraperitoneal glucose loaded rats. Results: The water extract significantly lowered the blood glucose level. When precipitated with alcohol, the activity was found in the soluble fraction. Glucose uptake in the isolated rat hemidiaphragm, was increased by the AF at 40 μg/ml concentration, the AF did not significantly influence insulin release from cultured islets. The AF was found to be effective in orally glucose loaded in contrast to intraperitonial route. Conclusion: Our findings suggest that this plant is promising for further studies leading to the development of valuable medicine for diabetes. Background: The plants selected for the study were traditionally used in siddha system of medicine in neurological disorders. Aim: The aim of the following study isto screen the plant species for both acetylcholinesterase (AchE) and butyrylcholinesterase (BuchE) inhibition by in-vitro Ellman's method and a thin layer chromatography bioautographic assay for newer drug candidates for the treatment of Alzheimer's disease. Materials and Methods: Ellman's colorimetric method was performed in a 96 well micro plate for cholinesterases inhibition using galantamine as standard drug. Results: Present studies confirmed that out of all the tested extracts Hemidesmus indicus R.Br (HI) showed considerable IC 50 values for AchE (28.40 ± 0.92 μg/mL) and BuchE (43.47 ± 0.64 μg/mL) inhibition which indicates that HI extract has considerable specificity toward AchE and BuchE compared with all the tested extracts and the activity was followed by Vernonia anthelmintica (VA) Willd and Saussurea lappa Clarke (SL). The bioautograms also confirmed the activity potent extracts. Conclusion: Besides various bioactivities HI, VA and SL exhibited considerable cholinesterases inhibition making it to consider these species for further investigation of new compounds. Background: The rhizomes of Acorus calamus and their essential oil are widely used in the flavoring industry and production of alcoholic beverages in Europe. Recent reports have confirmed the presence of several pharmacological components in the rhizomes of A. calamus. Objective: The objective of this study was to find out the efficacy of topical administration of ethanolic extract of A. calamus on dermal wound healing in rats. Wound healing is a natural process occurring in living organisms, which results in a complete or partial remodeling of injured tissue and ultimately progresses to the formation of a fibrous scar. Several natural products have been reported to augment the wound healing process. Materials and Methods: An ethanolic extract of A. calamus was prepared and its wound-healing efficacy was studied. An excision wound was made on the back of the rat and 200 μL (40 mg/kg body weight) of the A. calamus extract was applied topically once daily for the treated wounds. The control wounds were treated with 200 μL of phosphate buffered saline. Results: The granulation tissues formed were removed at 4, 8 and 12 days and biochemical parameters such as deoxyribonucleic acid, total protein, total collagen, hexosamine and uronic acids were measured. The amount of type I/III collagen formed in control and treated wound tissues was evaluated by sodium dodecyl sulfate-polyacrylamide gel electrophoresis. The epithelialization time, tensile strength and histological examination of the wounds were also studied. Biochemical analyses of the granulation tissues revealed a significant increase in collagen, hexosamine and uronic acid when compared with the control. The tensile strength of extract treated wounds was found to increase by 112%. A significant reduction in lipid peroxide levels suggested that A. calamus possesses antioxidant components. Conclusions: The results strongly confirm the beneficial effects of A. calamus in augmenting the wound healing process. Colon cancer (CRC) is a serious health problem through worldwide. Development of novel drug without side effect for this cancer was crucial. Luteolin (LUT), a bioflavonoid has many beneficial effects such as antioxidant, anti-inflammatory, anti-proliferative properties. Azoxymethane (AOM), a derivative of 1, 2-Dimethyl hydrazine (DMH) was used for the induction of CRC in Balb/C mice. CRC was induced by intraperitoneal injection of AOM to mice at the dose of 15 mg/body kg weight for 3 weeks. Mouse was treated with LUT at the dose of 1.2 mg/body kg weight orally until end of the experiment. The expression of inducible nitric oxide synthase (iNOS) and cyclooxygense (COX)-2 were analyzed by RT-PCR and immunohistochemistry. The expressions of iNOS and COX-2 were increased in the case of AOM induction. 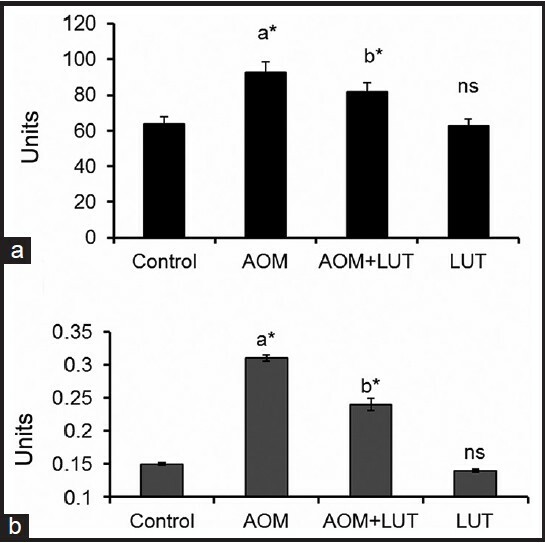 Administration of LUT effectively reduced the expressions of iNOS and COX-2. The present study revealed that, LUT suppresses both iNOS and COX-2 expressions and act as an anti-inflammatory role against CRC. Background: Tanshinone IIA (TSIIA) on solid dispersions (SDs) has thermodynamical instability of amorphous drug. Ternary solid dispersions (tSDs) can extend the stability of the amorphous form of drug. Poloxamer 188 was used as a SD carrier. Nano-CaCO 3 played an important role in adsorption of biomolecules and is being developed for a host of biotechnological applications. Objective: The aim of the present study was to investigate the dissolution behavior and accelerated stability of TSIIA on solid dispersions (SDs) by the use of ternary systems with nano-CaCO 3 and poloxamer 188. Materials and Methods: The TSIIA tSDs were prepared by a spray-drying method. First, the effect of combination of poloxamer 188 and nano-CaCO 3 on TSIIA dissolution was studied. Subsequently, a set of complementary techniques (DSC, XRPD, SEM and FTIR) was used to monitor the physical changes of TSIIA in the SDs. Finally, stability test was carried out under the conditions 40°C/75% RH for 6 months. Results: The characterization of tSDs by differential scanning calorimetry analysis (DSC) and X-ray powder diffraction (XRPD) showed that TSIIA was present in its amorphous form. Fourier transforms infrared spectroscopy (FTIR) suggested the presence of interactions between TSIIA and carriers in tSDs. Improvement in the dissolution rate was observed for all SDs. The stability study conducted on SDs with nano-CaCO 3 showed stable drug content and dissolution behavior, over the period of 6 months as compared with freshly prepared SDs. Conclusion: SDs preparation with nano-CaCO 3 and poloxamer 188 may be a promising approach to enhance the dissolution and stability of TSIIA. Background: Stryphnodendron adstringens (Mar.) Coville is a native plant from Brazil, rich in phenolic compounds and used on popular medicine as a wound healing agent, in the treatment of gastric lesions and as antimicrobial. Materials and Methods: Ultrassound-assisted extraction (UAE) was applied to extraction of epigallocatechin gallate (EGCG), total polyphenols (TP) and total tannins (TT) content from barks of Stryphnodendron adstringens (Mar.) Coville. Several operating parameters, namely extraction time (min), liquid to solid ratio (mg/mL), ethanolic strength (%, v/v), were optimized using response surface methodology (RSM) with a Box-Behnken design. Results: By using the desirability function approach, the optimum UAE conditions to obtain desirable extraction yields for all these metabolites simultaneously were found at the extraction time of 30 min, solid to liquid ratio of 4 mg/mL and ethanolic strength of 65. Under these conditions, the epigallocatechin gallate, total polyphenols and total tannins content were 0.31; 22.95 and 11.95 % (w/w), respectively. Conclusion: The results indicated that knowledge gained from this study should be helpful to further exploit and apply this resource and also showed the feasibility of ultrasound-assisted extraction for obtaining GEGC, TP and TT from barks of S. adstrigens. Background: Paris quadrifolia L. is a medicinal plant which contains steroidal saponins. The present study reports isolation and structural identification of six pennogenyl saponins obtained from P. quadrifolia rhizomes. The four spirostan saponins were obtained from P. quadrifolia for the first time. The cytotoxic effects of the sub-fractions and six compounds isolated from the plant extract were evaluated on tumour cells. Materials and Methods: Ethanol extract from the rhizomes of P. quadrifolia were partinioned using column chromatography. The saponins were isolated from the obtained sub-fractions by isocratic RP HPLC and their structures were determined by means of 1D and 2D NMR spectroscopy and MALDI TOF MS. The cytotoxic effects of the sub-fractions and the isolated compounds were tested against human promyelocytic leukaemia cells (HL-60), human cervical adenocarcinoma cells (HeLa) and human breast cancer cells (MCF-7) using the [(3-(4,5-dimethylthiazol-2-yl)]-2,5-diphenyltetrazolium bromide (MTT) assay. 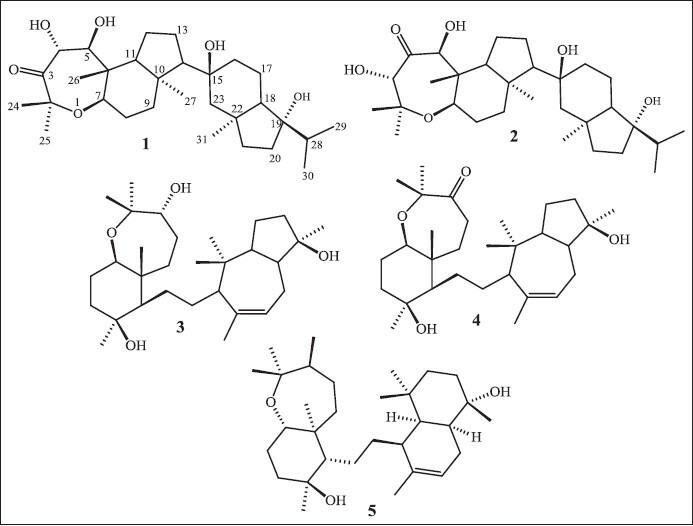 Results: Six pennogenyl saponins were isolated from P. quadrifolia rhizomes: pennogenin 3-O-β-D-glucopyranoside (1), pennogenin 3-O-α-L-rhamnopyranosyl-(1→ 4)-β-D-glucopyranoside (2), pennogenin 3-O-α-L-rhamnopyranosyl-(1→ 2)-β-D-glucopyranoside (3), pennogenin 3-O-α-L-rhamnopyranosyl-(1→ 4)-α-L-rhamnopyranosyl-(1→ 4)-β-D-glucopyranoside (4), pennogenin 3-O-α-L-rhamnopyranosyl-(1→ 4)-[α-L-rhamnopyranosyl-(1→ 2)]-β-D-glucopyranoside (5), pennogenin 3-O-α-L-rhamnopyranosyl-(1→ 4)-α-L-rhamnopyranosyl-(1→ 4)-[α-L-rhamnopyranosyl-(1→ 2)]-β-D-glucopyranoside (6). 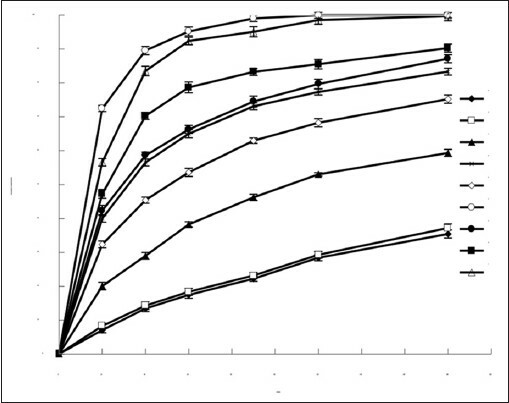 Pennogenyl saponins 5 and 6 exhibited cytotoxic activity against HL-60, HeLa and MCF-7 tumour cells with IC 50 values of 1.0 ± 0.04 μg/ml, 1.8 ± 0.072 μg/ml and 2.4 ± 0.096 μg/ml respectively, and 2.0 ± 0.08 μg/ml, 2.5 ± 0.125 μg/ml and 3.2 ± 0.128 μg/ml respectively. Conclusion: Compounds 1 -4 were isolated from this species for the first time. Background: Siphonochalina siphonella is a marine sponge collected from saudi Red Sea water and scare study from this region. 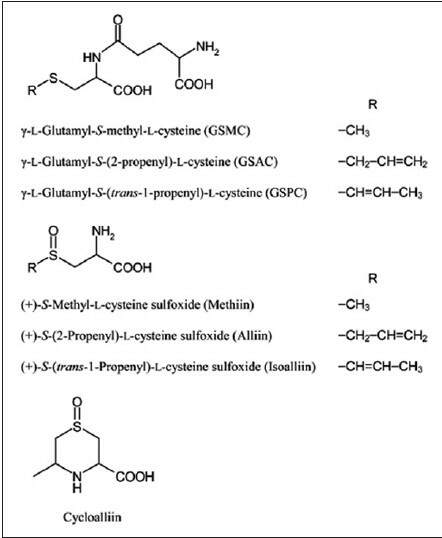 Objective: To isolate the anticancer triterpenes with potent cytotoxicity from marine sponge, Siphonochalina siphonella and state the mode of action in cancer cell lines. Materials and Methods: The sponge material was collected, extracted with organic solvent, and fractionated on different adsorbents. The structure of the pure metabolites were elucidated employing different spectroscopic techniques including 1D ( 1 H and 13 C) and 2D (COSY, HMQC and HMBC) NMR, and MS spectroscopy. 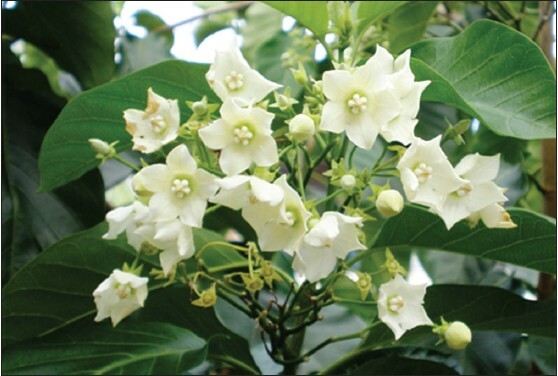 Results: A new Neviotine-C (1) was obtained, along with four known metabolites (2-5). All compounds, except 5, were tested towards MCF-7, PC-3 and A549 and showed effects with IC 50 in range 7.9-87 μM, whilst, 3 showed potent anti-proliferative activity against PC-3 and A549 with IC 50 = 7.9 ± 0.120 and 8.9 ± 0.010 μM, respectively. Conclusion: Compounds (1-4) showed significant cytotoxic activities, while 3 showed potent effect. The antiproliferative of 3 was attributed to signiﬁcant S-phase cell cycle arrest. Introduction: Plant latex is a natural source of biologically active compounds and several hydrolytic enzymes responsible for their diverse health benefits. Recent past has witnessed substantial progress in understanding their supplementary industrial and pharmaceutical utility. Calotropis gigantea is one of the important latex producing plants belonging to asclepediaceae family with wide ethnopharmacological applications and is rich in proteolytic enzymes. Present study investigates hemostatic, milk clotting and blood stain removal potential of C. gigantea latex proteases. Materials and Methods: The protease activity of crude enzyme (CE), obtained by centrifugation followed by ammonium sulphate precipitation and dialysis, was assayed using casein as the substrate. Effect of pH, temperature and specific inhibitors on protease activity was determined. 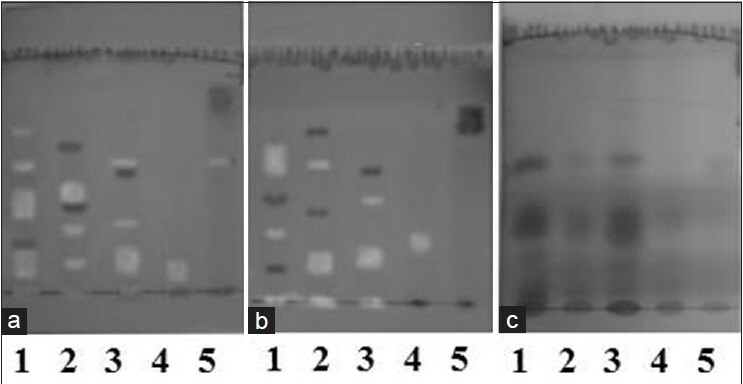 Native PAGE and in gel protease activity of CE was performed. Hemostatic (Fibrinogen polymerization, fibrinogen agarose plate and blood clot lysis assays), milk clotting and blood stain removal efficacies of CE were determined. Results: CE exhibited high caseinolytic activity. Enzyme activity was optimum at 37-50ºC and pH 8.0. Fibrinogen polymerization assay showed concentration dependent increase in turbidity indicating thrombin like activity which was further confirmed by fibrinogen agarose plate assays. Clot lysis assay indicated 92.41% thrombolysis by CE in 90 min. CE also revealed significantly high ratio of milk clotting to protease activity (Milk Clotting Index, MCI = 827.59 ± 1.52). Complete destaining of blood stained fabric was observed when incubated with 1% detergent incorporated with 0.1mg/ml CE. The study highlights and validates the compound application potential of latex cysteine proteases from C. gigantea. Background: Pyrostegia venusta (Ker. Gawl.) Miers (Bignoniacea) is a medicinal plant from the Brazilian Cerrado used to treat leucoderma and common diseases of the respiratory system. Objective: To investigate the antitumor activity of P.venusta extracts against melanoma. Materials and Methods: The cytotoxic activity and tumor induced cell death of heptane extract (HE) from P. venusta flowers was evaluated against murine melanoma B16F10-Nex2 cells in vitro and in a syngeneic model in vivo. Results: We found that HE induced apoptosis in melanoma cells by disruption of the mitochondrial membrane potential, induction of reactive oxygen species and late apoptosis evidenced by plasma membrane blebbing, cell shrinkage, chromatin condensation and DNA fragmentation, exposure of phosphatidylserine on the cell surface and activation of caspase-2,-3,-8,-9. HE was also protective against singeneyc subcutaneous melanoma HE compounds were also able to induce cell cycle arrest at G2/M phases on tumor cells. On fractionation of HE in silica gel we isolated a cytotoxic fraction that contained a mixture of saturated hydrocarbons identified by 1 H NMR and GC-MS analyses. Predominant species were octacosane (C 28 H 58 -36%) and triacontane (C 30 H 62 -13%), which individually showed significant cytotoxic activity against murine melanoma B16F10-Nex2 cells in vitro and a very promising antitumor protection against subcutaneous melanoma in vivo. Conclusion: The results suggest that the components of the heptane extract, mainly octasane and triacontane, which showed antitumor properties in experimental melanoma upon regional administration, might also be therapeutic in human cancer, such as in the mostly epidermal and slowly invasive melanomas, such as acral lentiginous melanoma, as an adjuvant treatment to surgical excision. Background: The slough shed of Cryptotympana atrata Fabricius is widely used to treat skin diseases in China, Japan, and Korea. Objective: To investigate the anti-inflammatory effects of C. atrata on contact dermatitis. Materials and Methods: We investigated the effects of C. atrata methanol extract (MECA) on ear swelling, histophathological changes and cytokine production in 1-fluoro-2,4-dinitrofluorobenzene (DNFB)-induced contact dermatitis (CD) mice. 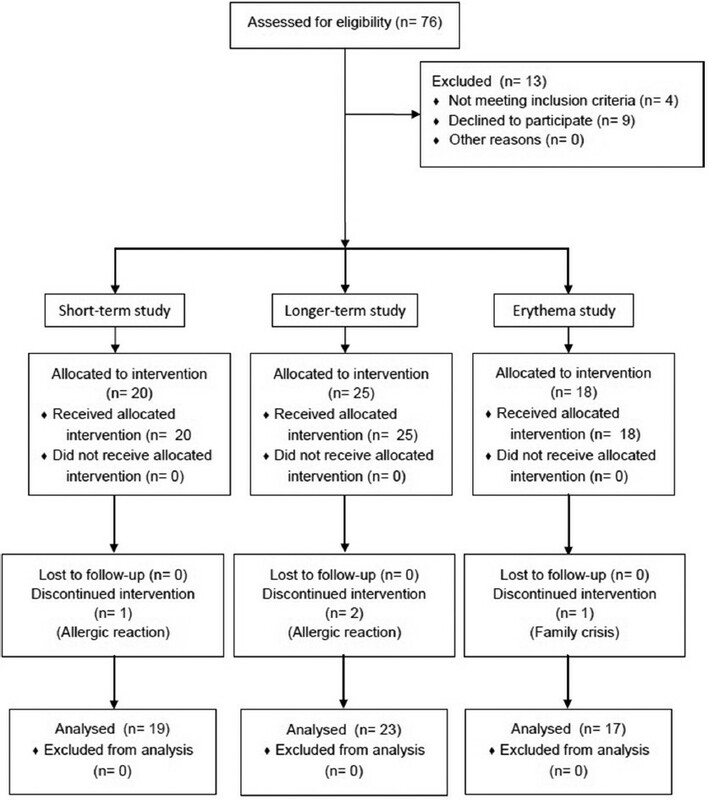 Results: Topical application of MECA effectively inhibited enlargement of ear swelling (30 and 100 μ/ear, P < 0.05; 300 μg/ear, P < 0.01). MECA treatment also inhibited hyperplasia, spongiosis (100 and 300 μg/ear, P < 0.001), and immune cell infiltration (30 μg/ear, P < 0.05; 100 and 300 μg/ear, P < 0.001) induced by DNFB. In addition, treatment with MECA suppressed the increase in the levels of TNF-α (P < 0.05), IFN-g (3, 100 μg/ear, P < 0.05; 300 μg/ear, P < 0.01), and IL-6 (100 μg/ear, P < 0.05; 300 μg/ear, P < 0.01) production. Conclusion: These data suggest that MECA has the potential for use in the treatment of inflammatory skin diseases, including CD. Moreover, the results presented herein indicate that anti-inflammatory actions of MECA are mediated by decreasing production of TNF-α, IFN-γ, and IL-6 in inflamed tissues. Objective: Hyperglycemia induced generation of free radicals and consequent development of oxidative stress by polyol pathway is one of the crucial mechanisms stirring up development of diabetic complications. We evaluated influence of ten vegetables' juice on polyol pathway along with their antioxidant and antioxidative stress potentials. Materials and Methods: Aldose reductase activity was determined utilising goat lens and human erythrocytes. In goat lens, utilization of nicotinamine adenine dinucleotide phosphate (NADPH) and aldose reductase inhibition was assayed. In human erythrocytes, sorbitol formation was measured as an index of aldose reductase activity under normoglycemic and hyperglycemic conditions. Ability of juices in inhibiting oxidative damage to deoxyribose sugar and calf thymus DNA and inhibitory activity against hydrogen peroxide induced hemolysis of erythrocytes was also analysed. Phytochemical contents like total polyphenol, total flavonoid and total protein were measured to find their influence on biological activities. 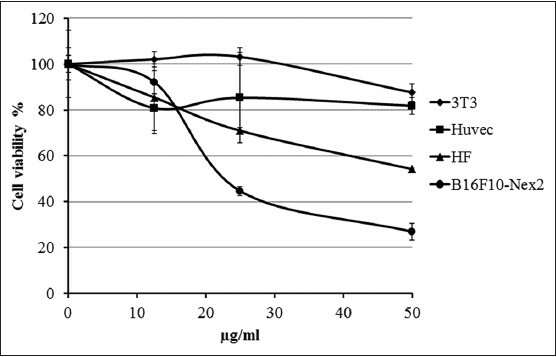 Results: Vegetables' juice displayed varying degrees of inhibitory potentials in mitigating NADPH dependent catalytic activity of aldose reductase in goat lens, accumulation of sorbitol in human erythrocytes under different glucose concentrations; Fenton-reaction induced oxidative damage to deoxyribose sugar, and calf thymus DNA. Substantial variations in vegetables phytochemicals content were also noticed in this study. Conclusions: Vegetables' juice possesses potent activities in influencing polyol pathway by various mechanisms in favour of reducing development of oxidative stress independent of their inherent antioxidative properties. Juice of ivy gourd followed by green cucumber and ridge gourd were among the most potent for they displayed strong activities on various parameters analysed in this study. These vegetables' juice may become part of mechanism-based complementary antioxidant therapy to prevent development of diabetic complications. Objective: To investigate the skin hydrating and anti-erythema activity of gel materials from Aloe marlothii A. Berger and A. ferox Mill. in comparison to that of Aloe barbadensis Miller (Aloe vera) in healthy human volunteers. Materials and Methods: Aqueous solutions of the polisaccharidic fractions of the selected aloe leaf gel materials were applied to the volar forearm skin of female subjects. The hydration effect of the aloe gel materials were measured with a Corneometer ® CM 825, Visioscan ® VC 98 and Cutometer ® dual MPA 580 after single and multiple applications. The Mexameter ® MX 18 was used to determine the anti-erythema effects of the aloe material solutions on irritated skin areas. Results: The A. vera and A. marlothii gel materials hydrated the skin after a single application, whereas the A. ferox gel material showed dehydration effects compared to the placebo. After multiple applications all the aloe materials exhibited dehydration effects on the skin. Mexameter ® readings showed that A. vera and A. ferox have anti-erythema activity similar to that of the positive control group (i.e. hydrocortisone gel) after 6 days of treatment. Conclusion: The polysaccharide component of the gel materials from selected aloe species has a dehydrating effect on the skin after multiple applications. Both A. vera and A. ferox gel materials showed potential to reduce erythema on the skin similar to that of hydrocortisone gel. Background: Many diseases are associated with oxidative stress caused by free radicals. The aim of the present study was to evaluate the antidiabetic, antioxidant and antiglycation properties of Eysenhardtia polystachya (EP) bark methanol-water extract. Materials and Methods : The antioxidant capacities were evaluated by studying in vitro the scavenging of DPPH and ABTS free radical, reactive oxygen species such as RO 2 , O 2· - , H 2 O 2 , OH . , H 2 O 2 , ONOO-, NO, HOCl, 1 O 2 , chelating ability, ORAC, β-carotene-bleaching and lipid peroxidation. The antiglycation activities of EP were evaluated by haemoglobin, bovine serum albumin (BSA)-glucose, BSA-methylglyoxal and BSA-glucose assays. Oral administration of EP at the doses of 100 mg/kg, 200 mg/kg and 400 mg/g was studied in normal, glucose-loaded and antidiabetic effects on streptozotocin-induced mildly diabetic (MD) and severely diabetic (SD) mice. Results: EP showed Hdonor activity, free radical scavenging activity, metal chelating ability and lipid peroxidation Antioxidant activity may be attributed to the presence of phenolic and flavonoid compounds. EP is an inhibitor of fluorescent AGE, methylglyoxal and the glycation of haemoglobin. In STZ-induced diabetic mice, EP reduced the blood glucose, increased serum insulin, body weight, marker enzymes of hepatic function, glycogen, HDL, GK and HK while there was reduction in the levels of triglyceride, cholesterol, TBARS, LDL and G6Pase. 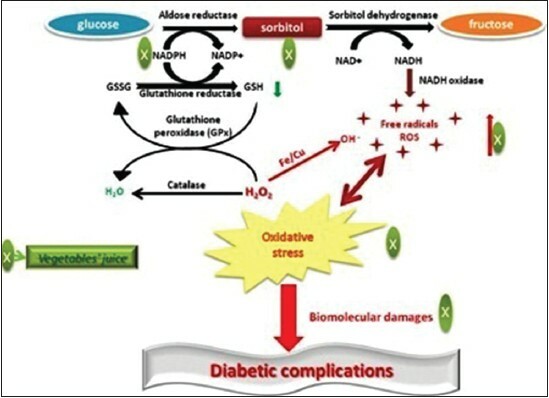 Conclusions: Eysenhardtia polystachya possesses considerable antioxidant activity with reactive oxygen species (ROS) scavenging activity and demonstrated an anti-AGEs and hepatoprotective role, inhibits hyperglycemic, hyperlipidemic and oxidative stress indicating that these effects may be mediated by interacting with multiple targets operating in diabetes mellitus. 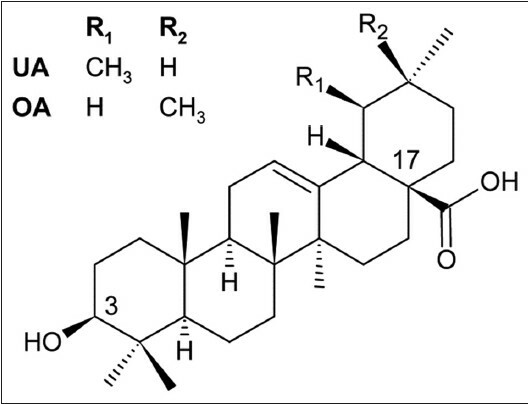 Objective: Safranal (2,6,6-trimethyl-1,3-cyclohexadiene-1-carboxaldehyde, C10H14O) is an active ingredient in the saffron, which is used in traditional medicine, and also, the biological activity of saffron in anti-cancer is in development. It has been reported to have anti-oxidant effects, but its anti-tumor effects remain uncertain. 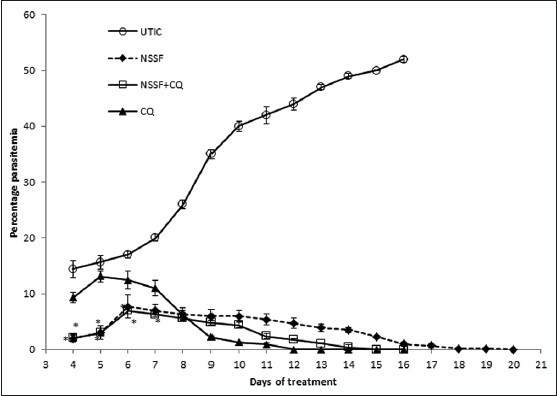 The aim of this study was to evaluate effects of safranal on anti-tumor on neuroblastoma cells. 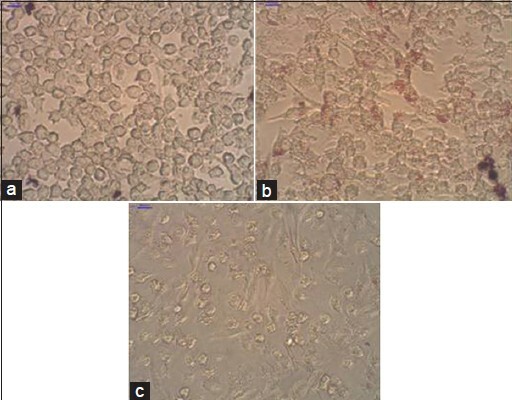 Materials and Methods: Neuroblastoma cells were cultured and exposed to safranal (0, 10, 15, 20, 50 μg/ml). Cell proliferation was examined using the 3-(4, 5-dimethyl thiazol-2-yl)-2, 5-diphenyl tetrazolium bromide (MTT) assay. Apoptotic cells, cell cycle distribution, and sub-G1 fraction were analyzed using flow cytometric analysis after propidium iodide staining. 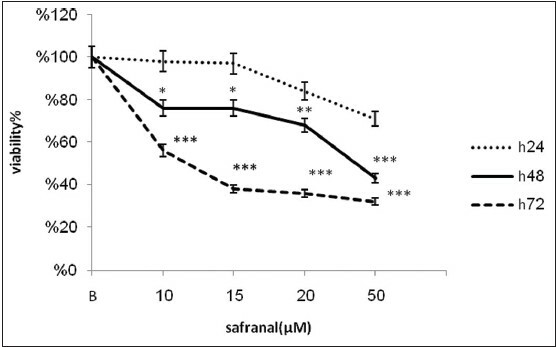 Results: Safranal inhibited the growth of malignant cells in a dose-and time-dependent manner. The IC (50) values against the neuroblastoma cell line were determined as 11.1 and 23.3 μg/ml after 24 and 48 h, respectively. 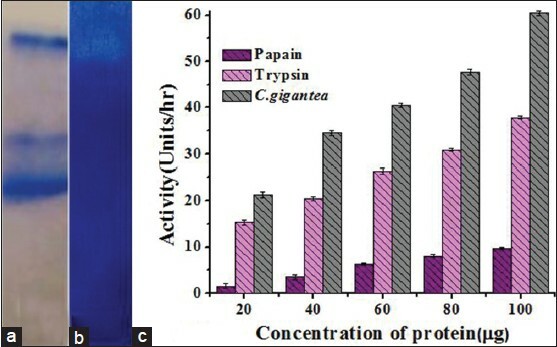 Safranal induced a sub-G1 peak in the flow cytometry histogram of treated cells compared to control cells indicating that apoptotic cell death is involved in safranal toxicity. Conclusions: Our pre-clinical study demonstrated a neuroblastoma cell line to be highly sensitive to safranal-mediated growth inhibition and apoptotic cell death. Although the molecular mechanisms of safranal action are not yet clearly understood, it appears to have potential as a therapeutic agent. Background: Application of ultrasound (US) to biotechnology is relatively new but several processes that take place in the presence of cells or enzymes are activated by ultrasonic waves. Genista tinctoria L. (Fabaceae) is rich on various kind of flavonoids, including isoflavones with valuable estrogenic activity. Objective: This study verified use of low-energy US elicitor to enhance secondary metabolite production in plant cell cultures. Materials and Methods: Suspension cultures of G. tinctoria cells was exposed to low-power US (with fixed frequency 35 kHz and power level 0.1 mW/cm 3 ) for period 1-5 min. Results: The US exposure significantly stimulated genistin content (0.8 mg/g DW) after 3 min of US treatment (sampled after 72 h). The highest daidzein level (1.4 mg/g DW) was reached after US irradiation for 5 min and 168 h sampling. Conclusion: The achieved results suggest that US can act as a potent abiotic elicitor to induce the defense responses of plant cells and to stimulate secondary metabolite production in plant cell cultures. Background: Gypsophila trichotoma Wend. (Caryophyllaceae) is a medicinal plant which is protected in Bulgaria by the Biodiversity Law. Previous studies have showed the presence of triterpene saponins, sterols, flavonoids, triterpens, etc. Objective: Gypsogenic acid, isolated from Gypsophila trichotoma roots, was evaluated for cytotoxic activity. Materials and Methods: The structure of the compound was elucidated by spectral methods. The cell survival fraction was determined by the MTT dye reduction assay, performed with some modifications. Results: Gypsogenic acid was tested in a panel of human tumor cell lines and was found to inhibit the proliferation of malignant cells. It was active against leukemic cells with lymphoid (SKW-3 and BV-173) or myeloid phenotype (HL-60, K-562, and LAMA-84), as well as against the EJ bladder carcinoma cell line. Bcr-Abl expressing myeloid cells (LAMA-84 and especially K-562) displayed lower sensitivity. HL-60/Dox cells were less sensitive to gypsogenic acid than the parent cell line, which shows that gypsogenic acid is probably a substrate of MRP-1. Background: Dracaena draco L. ssp. draco is known as the "dragon's blood tree" and it is endemic from the Canary Islands and Morocco. 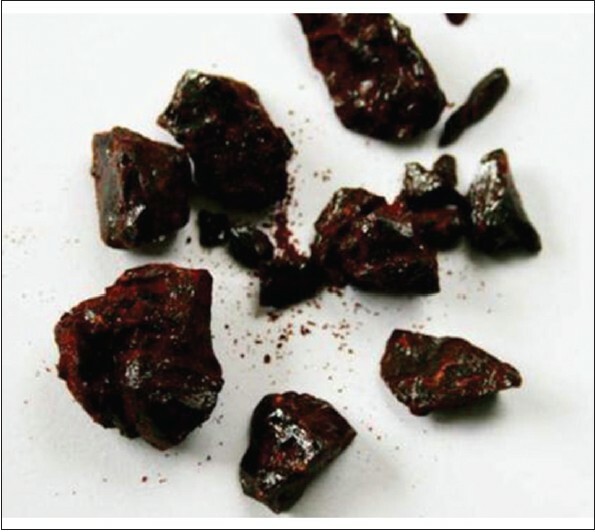 Objective: Carry out phytochemical investigation of acetonic extracts of red resin obtained from the trunk of D. draco, to obtain to the isolation of the most abundant resin constituents, belonging to the class of flavonoids: flavans, along with homoisoflavans and homoisoflavanones. Materials and Methods: The structures of the isolated compounds were established by Nuclear Magnetic Resonance (NMR) and mass spectrometry data and comparison with literature data. The acetonic extract was evaluated for its anti-staphylococcal properties against two reference strains. Results: The acetonic extracts resulted inactive at the maximum tested concentration of 1000 μg/ml against free living forms of tested staphylococci, but they showed a very interesting activity in the prevention of a biofilm formation at a concentration equal to 200 μg/ml against S. aureus ATCC 25923.